The uncertain UK General Election result has left many European allies asking what kind of Brexit the UK will seek, and whether it is in a position to open negotiations. A conference in Copenhagen this Tuesday morning will discuss the Danish perspective with speakers including Denmark’s Finance Minister, a former Prime Minister and Secretary General of NATO, business representatives, and the Secretary General of the Council of the European Union who is advising Donald Tusk on the Brexit negotiations. The web streamed conference is co-organised by Altinget, a leading news website, and Rasmussen Global, the consultancy founded by former Danish Prime Minister and NATO Secretary General, Anders Fogh Rasmussen. It will be opened by Mr Rasmussen, with speeches by Danish Finance Minister Kristian Jensen, and EU Council Secretary General Jeppe Tranholm-Mikkelsen. It will hear the arguments from businesses and business organisations exposed to Brexit, and Peter Hummelgaard Thomsen, MP, EU spokesperson for Denmark’s Social Democratic Party. 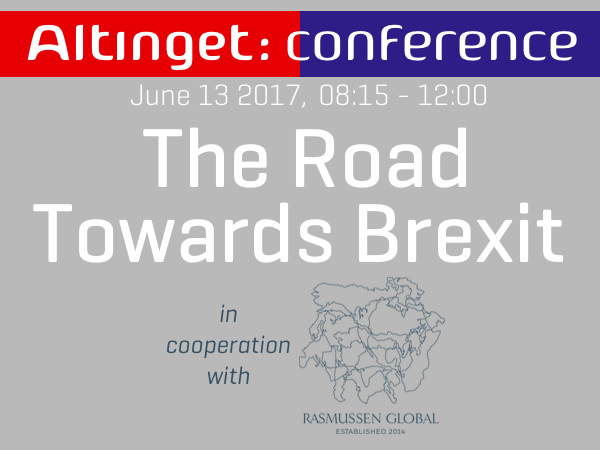 The conference will then hear the British perspective from Britain’s current Ambassador to Denmark, Dominic Schroeder, and Rasmussen Global Senior Adviser Sir Nigel Sheinwald, former British Ambassador to the EU and Washington, will address the global implications of Brexit. “Scandinavian countries have a great deal to lose from a messy divorce with the UK. We must speak up for our interests, and for a future relationship that keeps our markets as open as possible. “Businesses and governments alike are still grappling with the uncertainty and complexity of these negotiations. We regret the UK’s decision to leave, but we must not seek to punish Britain. We should find the best partnership possible. A full speakers schedule can be found by clicking on the link.